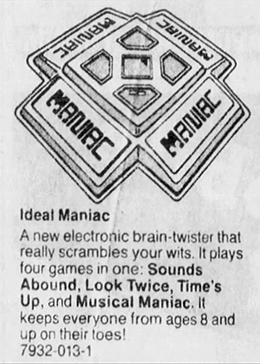 Combining lights, sound, and music, Maniac is a classic example of the microprocessor-controlled electronic games popular in the late 1970s. Released in 1979 by Ideal, the game was designed by video game pioneer, Ralph Baer, as a follow-up to his now-iconic Simon. 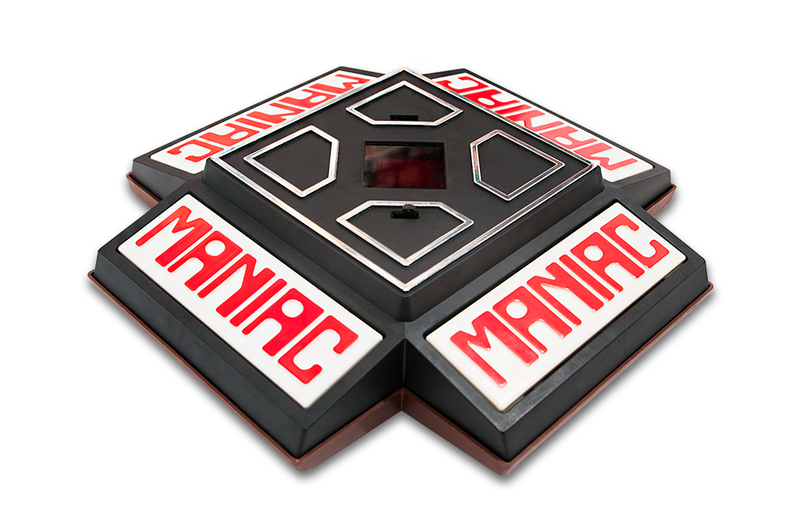 Designed for 2-4 players, Maniac is actually four games (or challenges) in one. Notably, it has no skill-level selection. Instead, Maniac automatically adjusts to the skill level of the players, becoming more difficult as player proficiency increases. The first challenge, Musical Mania, plays a series of random tones. The first player to hit their button when the music stops gets two points; the second gets a single point; the remaining players get zero points. Music is also center stage in the second challenge, Sounds Abound. In this round, players must count a series of random tones of varying speed and pitch. When the music stops, Maniac starts beeping. The first players that depresses their button when the number of beeps equals the number of tones played gets the two points. Challenge 3, Look Twice, adds a visual challenge. Maniac outputs a combination of tones and lights. The first player to recognize when a pattern is repeated and hit their paddle gets the two points. The last challenge, Your Time is Up, presents players with a high-pitched tone for a random length of time. Once the tone has ceased, the player who holds down their paddle for the length of time closest to what Maniac played secures two points. Each challenge is repeated three times before the next one is introduced. Rounds are repeated until a player reaches 25 points and is declared the winner. Four C-sized batteries power all this fun.